Two feline creatures allow me to share my condo with them. (Bodyguard gets irritated when I say I'm the "mother" of two cats. Ooops. Hehe!) The oldest one is 12 and the tiny, dumpster-found teeth-enhanced one is almost 5. Last February, I realized Pussachat (the eldest) had bad breath. Not as in "I just ate tuna so leave me alone" bad breath, but unhealthy, permanent, kitty-cat mouth smell. It also seemed she had less of an appetite in the last days and that indicated I had to bring her to the vet. I have been going to this vet since 1997 when I had my rabbits. Not all vets are rabbits vets. Rabbit vets get to charge double the price for a visit :o) and that's a different blog topic! Here I am, cat in hand, at the clinic with Pussachat who gets on the scale. It's just an ounce away from 15 lbs and that's not what is best for her already aching lower back. (She overdoes it by taking high jumps to go steal the little one's food). Eyes, ears, thermometer: everything is fine. Except she has a small case of gingivitis and she needs her teeth cleaned. That requires anesthesia and anesthesia equals blood tests and that translates into ching-ching. I suggest they isolate her right after the intervention because she's known to be right down nasty when waking up after anesthesia. I was even told to go get my own cat out of her cage at the SPCA because she was threatening to bite the attendant's arm off. This time for the teeth cleansing, they suggested a new type of anesthesia with the hope that it would help with her cattitude upon waking up. A bit over $500 later, my cat has a brand new smile and we head home. Her pupils are dilated to the size of dimes. I get her out of her cage and she heads straight for her food bowl. The vet told me she shouldn't eat too much right away and only soft foods. She's miaowing like there is no tomorrow and she won't stop going around in circles. This twelve-year old is pretty much a sofa cat. She lays there for hours and only moves if she sees me going to the kitchen (her food bowl) or bathroom (her faucet of choice). My cat is stoned and she's got a bad case of munchies! Not only are her pupils dilated, she won't sit down for a minute -even if I offer to brush her fur- and she has lost her coordination! She requests a drink at the bathroom faucet and what kind of a bad cat owner (mom) would I be if I declined this poor sedated (stoned) cat a drink of fresh-from-the-tap water? I get her on the counter and she knocks her face on the faucet! It takes her two minutes and a bit of my help to manage to drink from the faucet. My conclusion: we go back to the "old" type of anesthetics if we need another intervention! I'd rather have a falsely aggressive cat than a stoner-cat who needs supervision. In a conversation with the vet before I went to get my (stoned) cat, he tells me: "While she was still sleeping, I gave her a facial". Me = dumbfound. A what? I'm a certified esthetician, I know what a facial is! But excuse me, you gave my cat a facial? "You know she has acne, right?" No, I certainly did not! Cats get acne now? 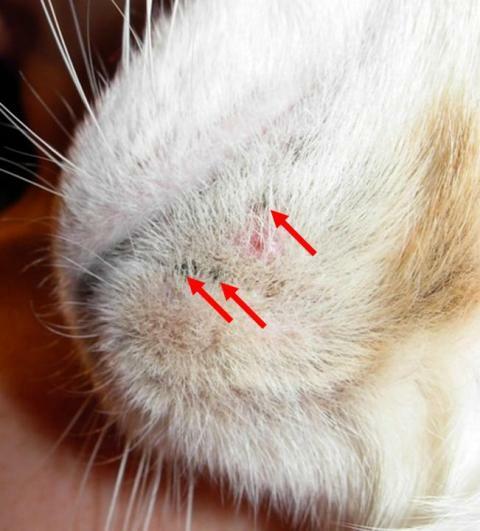 "Yes, feline acne. She has a lot of blackheads under her chin". Those are blackheads??? (Follow the red arrows on my pic) I thought she simply scratched herself too vigorously under the chin and it caused her scabs. I still can't believe what I'm hearing until he says: "You will have to help remove the blackheads". I truly appreciate this doctor and have the utmost respect for him, his clinic and his work. But is he kidding me? He had her sedated while he gave her a facial! Do you have any clue what it's like to try to remove ingrowns and blackheads from a cat's chin when she's fully awake? She's not quite collaborative, let me tell you! I now clean her chin (almost) every day with Hibitane, a skin cleanser for veterinary use. It has significantly reduced the number of scabs on her chin and she scratches less. I try, as much as she lets me, to remove her ingrowns and blackheads. Who'd have thought an esthetician's cat would have a bad case of acne? Posted by Miss IPP at 4:14 p.m.
Arianne July 10, 2010 at 6:22 p.m.
Oh my gosh so funny! Look at those dilated pupils!!! It's like Puss In Boots from Shrek. My parent's cat is the same -- she's about 8 now and she is also a sofa cat. Halifax July 10, 2010 at 9:16 p.m.
Micheline Faccone July 11, 2010 at 9:03 a.m.
You should have asked me...I knew about that, my cat had it! Except, I don't think it qualifies as acne...just a few blackheads...doctors pfffe! Makeup Mama July 11, 2010 at 11:30 p.m.
Rae // theNotice July 14, 2010 at 11:06 p.m.
MUA September 26, 2010 at 6:53 p.m. The facial made me LOL...What a vet !! !